Elephant hunting. Nothing quite captures the image of hunting the dark continent than does hunting the largest of all the earth's land animals--the African elephant. While good elephant hunting is still possible in today's Africa the areas for quality tusks are shrinking rapidly due to population expansion and land use. The largest tusked elephants to be found today are in eastern Botswana and western Zimbabwe--they are the same gene pool. Sadly many of them are shot over water holes with spot lights. I have turned down the chance to hunt this herd as I stay away from this type of hunting. 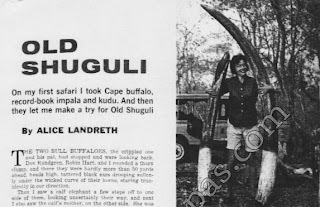 However, back in "the days" elephant hunting was as fair chase as possible and is illustrated in the 19 articles I have scanned here for you to read. Warren Page, Col. Askins, and Jack O'Connor all have there say here with some fine stories. Most interesting is Joseph Fenykovi's "I Shot the Biggest Elephant in the World." With small tusks for the hugh 13 foot tall size (about 80 pounds if I recall) this grand jumbo is in the Smithsonian Museum in DC. Elgin Gates, always a good writer of his adventures tells us of his experiences in "Year of the Big Ivory." It was still possible through the 1970s and even to the early 1980s to expect a 100 pounder on a 30 day safari. Stories of rogue elephant abound. "Death of a Rogue," "Those Bad Tempered Tuskers," and "Trouble by the Ton" are three. However, even in the good old days some folks hunted in a less than ethical manner. "Safaris That Stink" is a story of such practices. "Elephants on the Zambezi" strikes a personal note as I have hunted elephant three times on the shores of that great river: 2003, 2005, and 2008. (However I turned down a few shots as the ivory was smaller than I would like). "Old Shuguli" by Alice Landreth is one of the very few stories of female hunters--and she does an great job of it! Check out the photos of her and her tusks! Anyway, enjoy the articles. From all the emails I have been getting it is worth the effort! Thanks to you all.